2) Fistful of unsweetened tamarind soaked in 2 cups of water and strained [make sure to let it soak overnight]. You can also use some concentrated Tarmarind from any Middle Eastern or South Asian store. If you use the concentrated kind use 1 tbslp ONLY. In a pot full of water boil the potatoes until soft, but not mushy. Make sure they don’t fall apart. Once done run through a sieve and cool the potatoes with some cold water to stop the cooking process. You can either peel the potatoes or leave the peel one like I did, and halve. Then in a pot under medium high heat add the oil and the red chilly pepper. Let it simmer for 3 minutes. Then add the pickled lemons, and the tamarind and let simmer for another 3 minutes. Add salt, potatoes and half a cup of water and let simmer for another 5 minutes. Garnish with cilantro and serve hot. If you like it a little spicier you can add some green red chill–pickled or regular. Enjoy. I’ve heard of this dish many times before and always wanted to try it out and now I can because here’s the recipe (FINALLY!! YAY!) Jazaki Allahu Khairan habibti! Just one question, the ‘ushar, how do I make it? I am sure you have heard about it. When anyone from Yemen knows I am Adeni they always ask me, “Do you know how to make bataat abu humar!” Too funny. Waiyakum. Awwww. Yallah come on over and I’ll make it for you. I was actually enjoying bowl after bowl yesterday and thought of you and said, “If only Aqbal was here, we would be licking the pot clean.” Miss you habeebtee. Hmmm that’s a difficult one. Can you find just regular unsweetened tamarind and soak it for a few hours in warm water. Then squeeze out the tamarind fruit and use the water. You can run it through a sieve as well. This is always made with tamarind. Thank You i actually just asked my frined shes purerto rican and said she knows a mexican place who may sell them. Thank You Very Much. you dont know how happy i was to see your blog i couldnt any yemeni recipes. Alhamdullilah Jameli. Yes, if you follow the instructions insha Allah it turns out just the way that you remember it in Yemen. I am glad that it turned out. If you want to make a little more sauce in it, add more of the liquid ingredients that is the chilly sauce and the tamarind. If you only add water it will we watery and you will sacrifice taste. Hope that makes sense. Humar spelled “حُمَر ” in Arabic is the Adeni word for Tamarind. So, it takes it’s name from the addition of this fruit to the potatoes I guess. I didn’t invent it, it’s been called that for as long as i can remember in Aden. Another question is to making Usher is same way of our fellow North Africans brothers? after soaking the tamarinds i use the water that was soaked or do i need to squeeze the seeds out and use the tamarind as well.would that also make it a little more soupy. i got a bit confused there i was only squeezing out the tamarind. Squeeze them, it will make it nice and thick and will intensify the flavor. Hope that makes sense. Yes they add more tamarind to th sauce than the red chilly. I like the balance between the two. 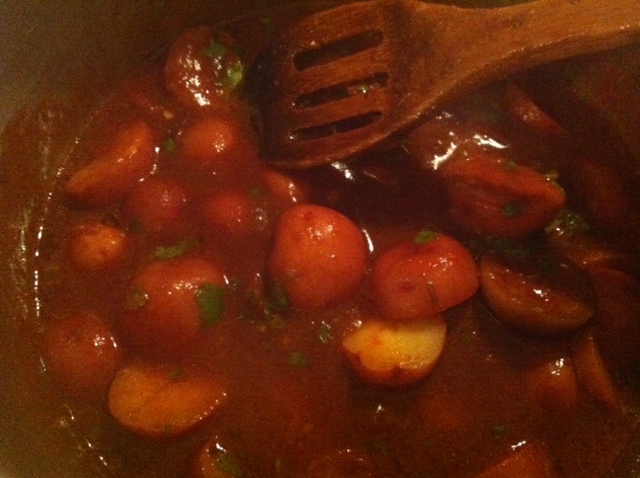 To make it browner add more tamarind and not too much chilly sauce. Hannah how did you deal with the tamarind? Did you soak it for a while and then take out the seeds and the solids and use the thick tamarind sauce [that results from soaking it for hours] in this dish? I can’t tell where the excess water is coming from if you are saying that you did not add water–because the ingredients in this dish are very specific and do not produce water at all. Indeed you have to add water for it to turn out soupy. So, where is the excess water coming from? 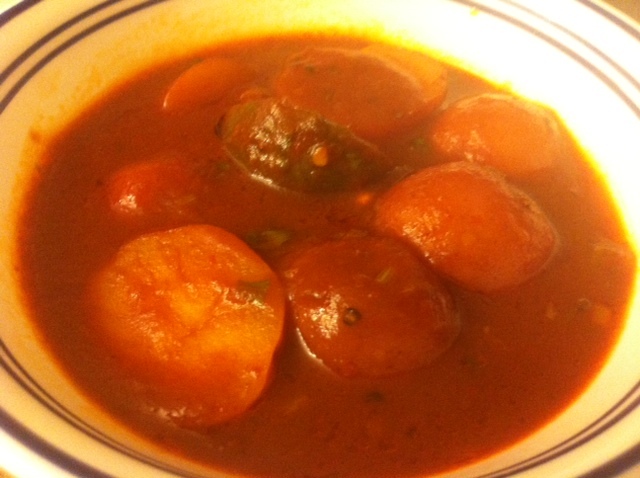 Did you soak the tamarind in too much water, or is your chilly pepper very runny? What is this eaten with? I mean is it eatne just plain or some bread is served with it. It is eaten just plain. Like a snack! It is eaten plain. Like a snack.